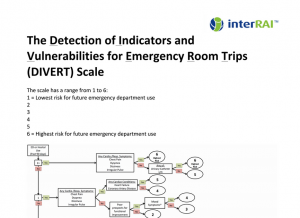 With many thanks to Andrew Costa and his team of researchers, AcuteNet now offers ‘The Detection of Indicators and Vulnerabilities for Emergency Room Trips’, also known as DIVERT Scale, within interRAI clinical assessments instrument portfolio. 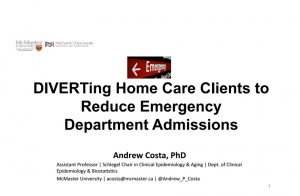 DIVERT Scale is designed to classify the risk of emergency department use in frail community-dwelling older adults. 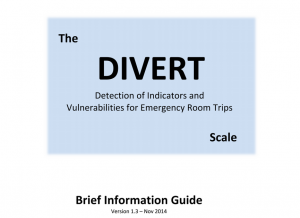 DIVERT is developed from a multi-year, census-level cohort study of home care patients and informed by a multi-national clinical panel. 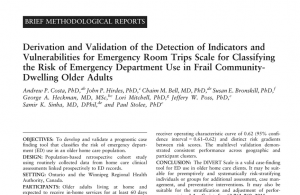 Clinicians can now determine the risk propensity of elderly and frail population visits to emergency rooms from low to high as a standard AcuteNet offering.